Church. The teaching remained, however, incomplete. The outbreak of the Franco-Prussian War and the advance of the Piedmontese troops on Rome forced the Council to adjourn hastily after defining the papal primacy of jurisdiction and infallibility, but without discussing and voting on an additional, longer document, which had been prepared to give more complete teaching on the Church as a whole. Italian troops seized Rome on 20 September 1870, and a month later the Council was formally suspended and never reconvened.200 This turn of events left much unfinished business, including reflection on the Church's mission to evangelize the world. Sixty-seven other missionary bishops joined Blessed Daniele Comboni (1831—81) in presenting for the Council's discussion a stirring petition on behalf of the Black Populations of Central Africa. As regards evangelization and other aspects of doctrine on the Church, Vatican I left behind a lopsided view that highlighted the central mission of the pope and had little to say directly about the mission of bishops, priests, deacons, religious, and laity. Many lights and shadows characterized the run-up to Vatican II and its ample teaching on the Church. Both before and after that Council, for better or worse, the theory and practice of the Catholic Church remained inextricably bound together. 200 R. Aubert, C. Butler, G. Martina, G. Thils, and other scholars have produced helpful studies on Vatican I. But the best work is K. Schatz, Vaticanum I. 1869—1870 (3 vols. ; Paderborn: Schöningh, 1992—4). For a summary account, see H. J. Pottmeyer, 'Vatican Council I', in R. P. Mc Brien (ed. ), The HarperCollins Encyclopedia of Catholicism (San Francisco: HarperSan Francisco, 1995) , 1296—8. For various themes which follow below, see in this order these entries in the Oxford Dictionary of the Christian Church : 'Comboni, Bl [Antonio] Daniele', 'Anglican Ordinations', 'Ecumenical Movement', 'Faith and Order', 'World Council of Churches', 'Malines Conversations', 'Anglican-Roman Catholic International Commission (ARCIC)', 'Couturier, Paul Irenee', 'Fisher, Geoffrey Francis', and 'John XXIII'. 43 countries, signalled the wide commitment to this search for Christian dialogue and, eventually, union. No Catholic delegation attended this conference, nor did any take part in the first meeting of Faith and Order, an ecumenical body founded to study theological problems underlying divisions between Christians, which first met at Lausanne in 1927. Likewise, the Catholic Church was not officially represented at Amsterdam in 1948, when 147 Protestant, Anglican, and Orthodox churches formed the World Council of Churches. Eventually, thanks to Pope John XXIII and others (of whom more below), the Catholic Church officially joined the Faith and Order Commission in 1968, and, while not becoming a member, has since 1965 enjoyed regular contacts with the World Council of Churches through the Joint Working Group. But for many decades Catholic leaders responded to the ecumenical movement with caution and even suspicion. Pope Pius XI, in his 1928 encyclical Mortalium Animos, even if it was officially dedicated to 'fostering religious union', judged that Catholic participation in assemblies with other Christians could all too easily give the impression that one religion or church was as good as another. Along with very many Catholics, the Pope's model of reunion was the return of non-Catholics to the Catholic Church, which he took to be simply coextensive with the One Church founded by Christ. Some ecumenical initiatives involved Catholics and prepared the ground for what would come with Pope John XXIII and Vatican II. Viscount Halifax, supported by Cardinal Désiré Joseph Mercier (archbishop of Malines), brought together some outstanding Anglican and Catholic theologians to discuss such central themes as the Eucharist and the mission of bishops and popes. The Malines Conversations (1921, 1923, and 1925), while producing no immediate fruit, helped to open the way for the Anglican-Roman Catholic International Commission (ARCIC), which, after a preparatory Malta Report (1968), began its work with a nine-day meeting at Windsor in 1970. Cardinal Mercier died in 1926, and Viscount Halifax in 1934. By the early 1930s another enduringly valuable innovation was in place. was received into the Catholic Church. In 1934 Paul Irenee Couturier (1881—1953), a French priest who met many Orthodox Christian refugees from the Russian Revolution of 1917 and was impressed by the ecumenical initiatives of Cardinal Mercier, helped to universalize an octave of prayer for Christian unity (18—25 January). Through his vast correspondence and tracts on more inclusive prayer for unity, Couturier enjoyed contacts with Christians around the world and encouraged innumerable people to pray for 'the unity Christ wills, by the means he wills'. His work lives on in the widely observed Week of Prayer for Christian Unity, and enjoyed a moving outcome on 18 January, early in the Holy Year of 2000. 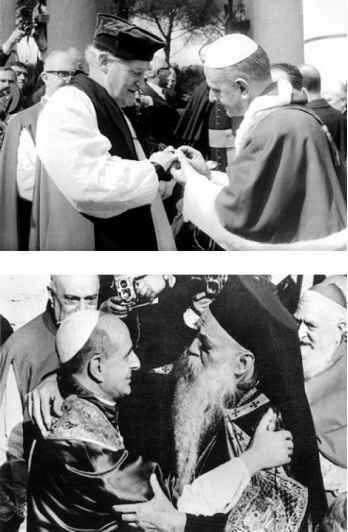 The (Anglican) archbishop of Canterbury, George Carey, together with Metropolitan Athanasios, a representative of the (Orthodox) Ecumenical Patriarch of Constantinople, joined Pope John Paul II in opening the holy door of St Paul's Basilica (outside the old walls of Rome) and in the service for Christian unity that followed. Forty years before, the then archbishop of Canterbury, Geoffrey Fisher (1887-1972), had visited Pope John XXIII in 1960, the first archbishop of Canterbury to visit a pope since 1397. All kinds of relations with other Christians played an essential role in moving Catholicism towards the teaching on the Church elaborated by Vatican II. Beyond question, one must list high among these relations the common suffering endured in two horrendous world wars and the persecution that faithful Christians endured from totalitarian regimes, especially from Communism and Nazism. Concentration camps, prisoner-of-war camps, and gaols fostered an ecumenism under the cross. But what happened within the Catholic Church to make possible the teaching of Vatican II? Pope Leo XIII cautiously opened one or two doors. His 1897 encyclical on the Holy Spirit, Divinum Illud Munus ('That Divine Gift'), called the Holy Spirit the 'soul' of the Church, which is the 'mystical Body of Christ' (DH 3328). At least four developments should be recalled. First of all, the initiatives of lay Catholics began to break down the division encouraged by a Gratian-style separation of the Church into clergy and laity. By championing human rights, Leo XIII's 1891 encyclical Rerum Novarum ('Of New Things') encouraged lay Catholics to become activists in trade unions and political parties. Much earlier in the nineteenth century an Irish layman, Daniel O'Connell (1775-1847), led the successful struggle for the Roman Catholic Relief Act of 1829, which removed most of the civil disabilities under which Catholics in the British Isles had suffered. From the early decades of the twentieth century, various large lay movements sprang up in Europe and around the world. Thus the 'Jocists' ('Jeunes Ouvriers Chrétiens') or Young Christian Workers formed a Catholic Action movement which was established after the First World War in Belgium by Joseph (later Cardinal) Cardijn (1882—1967) and spread to the United States, Australia, and other countries. It encouraged laypersons to become shining examples of Catholic faith and to share Christian values in their workplace. The Jocists helped to prepare Vatican II's vision of the role of laypeople in the Church and the world. So too did the Legion of Mary, a lay Catholic association founded by Frank Duff (1889-1980) in 1921 that spread from Dublin to many parts of the world. The Legion combined a serious life of prayer with apostolic activities. Leo XIII's 1893 encyclical on the Bible, Providentissimus Deus ('the Most Provident God'), should have meant a new spring in Catholic biblical studies. Just three years earlier a great Dominican scholar, Marie-Joseph Lagrange, had opened the first Catholic institute of higher biblical and archeological studies in modern times, the école Biblique in Jerusalem. In 1909 another such centre for advanced study of the scriptures, the Pontifical Biblical Institute, opened in Rome and has been staffed by Jesuits. Shadowed often by the suspicions of Church leaders, Lagrange and other professors in both institutes needed intellectual and spiritual courage to carry on their work. The tide turned in 1943 when Pius XII's encyclical Divino Aifflante Spiritu ('With the Divine Spirit Inspiring') strongly promoted biblical studies among Catholic scholars. A solid input from scriptural scholars enriched such Vatican II documents as Dei Verbum (see Ch. 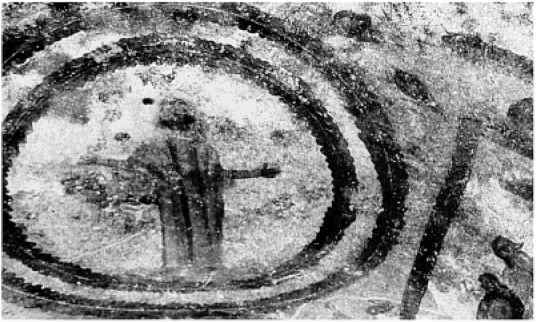 3) and Lumen Gentium (see below). For these and other documents, biblical scholarship provided a scriptural perspective on the Church, something that Vatican I lacked. The biblical movement was an essential second development in the making of Vatican II. 201 For further information see 'Constitution on the Sacred Liturgy' and 'Liturgical Movement' in The HarperCollins Encyclopedia of Catholicism ; and 'Liturgical Movement', 'Solesmes', and 'Maria Laach' in The Oxford Dictionary of the Christian Church . 202 Trans. Divided Christendom: A Catholic Study of the Problem of Reunion (London: Geoffrey Bles, 1939). 204 See T. I. MacDonald, The Ecclesiology of Yves Congar: FoundationalThemes (New York: University Press of America, 1984); J. Fameree, L'Ecclesiologie d'Yves Congar avant Vatican II (Leuven: Leuven University Press, 1992); 'Congar, Georges-Yves', Oxford Dictionary of the Christian Church , 397—8. 205 Trans. Catholicism: A Study of the Corporate Destiny of Mankind (London: Burns & Oates, 1950). and, often, have not even heard of Jesus Christ and his message. By co-founding in 1942 Sources Chrétiennes, a collection of patristic and medieval texts that by the end of 2001 included 463 volumes, de Lubac helped revivify Catholic theology in general and appreciation of the Church in particular. His writings on atheism, Buddhism, the thought of Pierre Teilhard de Chardin (1881—1955), and many other subjects facilitated the intellectual climate in which Vatican II prepared and promulgated its longest document, Gaudium et Spes, the pastoral constitution on the Church in the modern world. Like Congar, de Lubac served the bishops as an influential specialist at the Council.